Drones are changing many aspects our life and your mind is probably going to the spectacular videos you’ve seen online when you think about drones. However, racing drones are built with a very different purpose. The main difference being the first-person view (FPV) camera, which allows pilots to fly through the FPV perspective with the help of video goggles connected to their racing drone via radio. The goggles stream real-time video back to the pilot, allowing them to see all the action from their drone’s perspective as they weave their way through the drone racing course. The video feeding to the racer isn’t the best quality, but it’s still enough to give the sensation of flying that keeps drone pilots coming back for another race. Drone racing is quickly becoming one of the hottest hobbies and there are multiple clubs and leagues that pit serious competitors against one another. Drone racing has all the adrenaline of flight and it appeals to drone flying hobbyist, aspiring pilots and computer game fans alike. Here is our list, in no particular order, of the Top 10 best racing drones currently available on the market to help you compare various models quickly and easily. It is recommended to buy a smaller, less expensive drone like the Hubsan X4 H107D FPV quadcopter if you’re just starting out in your racer training. The X4 H107D is ready to fly right out of the box and an affordable way to get into FPV drone racing. 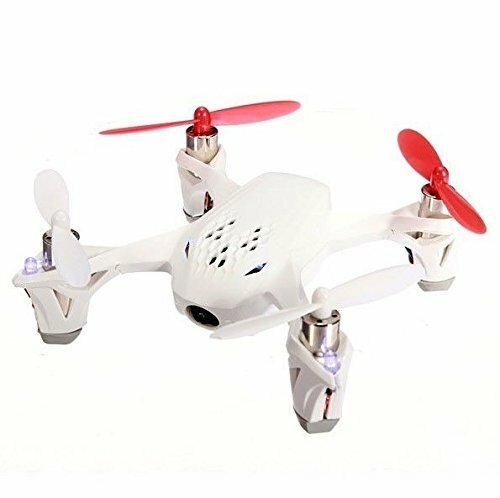 This drone is a very popular choice for beginners. The main feature of this drone is the FPV camera mounted to the front. The drone is also equipped with the 6-axis flight control system. This system gives you stable flight indoors or outdoors while you’re learning to fly. The Hubsan X4 H107D also features durable frame and blade guards, which will help lessen the impact of when you eventually race straight into a tree. It is important to note that you’ll be watching through your transmitter’s screen instead of goggles, which will not give you the true FPV racing feel. However, you are able to look up and see your drone, which will be helpful as you learn the controls. The Hubsan X4 H107D might not be considered a “serious” racing drone. However, it is going to minimize both cost and danger as you explore the FPV racing world. 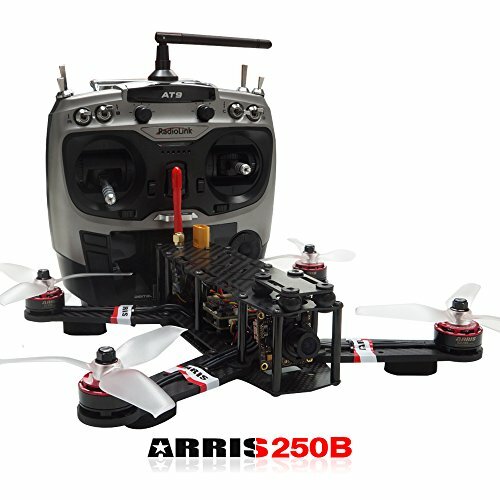 The Arris FPV250 250 Racer is one of the best drones for sale for racers because it comes in at a realistic price point and has the 700TVL camera that provides no latency/zero delay. This drone is both fast and durable and it can reach speeds of up to 20 mph. This is an excellent option for close-quarters drone racing because it’s relatively easy to control and maneuver in tight spots. Thanks to its composite fiberglass frame, this build is very strong and durable. It’s also easily modified because it uses standard connectors. You’ll have to install the propellers to get it up and running and once it’s set up, you’ll have one of the fastest and most affordable racing drones on the market. This is not exactly ready to fly right out of the box, because you need to provide your own camera system, battery and remote. However, it’s the best almost ready to fly solution available for those looking for speed. Also, there are a lot of viable and affordable FPV drone goggle options that work with this model. This is a video of the maiden flight of my Arris FPV 250 build. Expand comments for details of this build. If you have any questions, please feel free to comment. The Blade FPV Nano QX quadcopter is another great racing drone. This drone isn’t going to get you the top speeds and maneuverability of pricier racing quads. 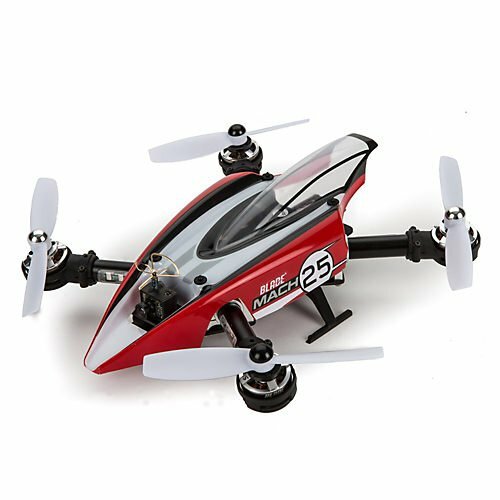 However, there are plenty of features packed into this tiny drone that make it a perfect starting drone for a training racer. Blade has also included their innovative Sensor Assisted Flight Envelope (SAFE) technology with this model. This technology makes flight easier by helping you take off and avoid crashing. The Blade Nano QX is so lightweight that it doesn’t gain a lot of speed when falling out of the sky. The drone also has awesome built in prop guards, which allows you to both bump into walls and the ceiling without risking damage to your propellers. The price tag for the FPV Nano QX is going to be a little steeper. However, the Nano QX is one of the only drones this small and affordable to include actual FPV racing goggles instead of a screen on the transmitter. It is important to note that flying with the goggles is going to be more challenging. However, it will give you the true FPV flying experience and allow you to become comfortable with what can sometimes be a very disorienting experience. The Blade FPV Nano QX gives you the immersive FPV flying experience in a small package with an affordable price and it is considered to be a great beginner racing drone. The Walkera F210 Professional Racer is admittedly one of the strangest, bulkiest-looking racing drones to buy. However, you shouldn’t let its appearance fool you because this drone can buzz around with the best of them! It’s a truly innovative design that’s incredibly fast. This drone comes with a reliable Devo 7 transmitter and has a unique 700TVL night vision camera. This camera has a wide 120 degree viewing range and allows you to practice at night. It also has a carbon fiber frame that’s ultra durable. The Walkera F210 Professional Racer also has ridiculous-looking mushroom antenna in the back, which might be an eye soar. However, the manufacturer placed it there for superior transmission capabilities, making it less likely that you’ll lose contact with your quad in the middle of a race. The drone is driven by four powerful 2500kv brushless motors that push it to the limits. These motors give it incredible speed and zip and the drone is incredibly fast when you give some pitch. The Walkera F210 Professional Racer is the perfect entry-level professional racer and one of the best plug and play solutions on the market right now. 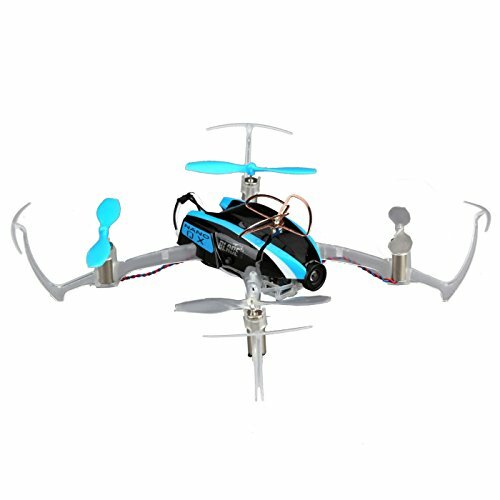 This fast little racer quadcopter is very suitable for new FPV fliers. Yet, give it some pitch and watch it scream! You can even fly FPV in the dark with its IR camera. The Walkera Runner 250 is in the 250mm class and the carbon-fiber materials from which the drone is made allow you to reach speeds of up to 40 km/h. 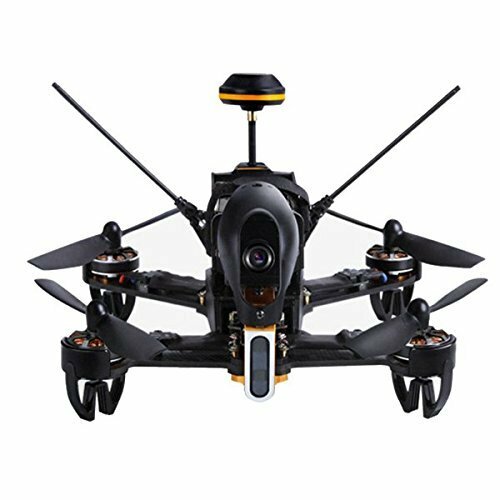 The frame is constructed from extremely strong carbon fiber materials and it is noticeably more durable than hobbyist drones. This drone has accurate and sensitive controls and has operating range of an impressive 1000 meters. It is also important to note that that Walkera produces an FPV drone goggle system that’s compatible with this drone. The price is going to vary depending on which package you’re looking for. 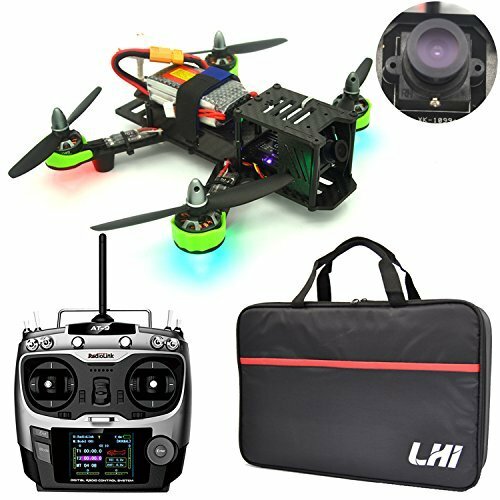 The most basic set-up has the assembled quadcopter, transmitter, flight battery, and battery charger and you can add features like a camera and on-screen display for an increasing price. However, the complete racing package, with FPV video goggles included, is going to cost around $750. The Walkera Runner 250 is a great choice for those people who are planning to enter drone races that have a lot of corners and obstacles. This drone may be more expensive for a complete package. However, the price reflects a quality racing drone with RTF convenience and the potential for a full FPV experience. Additional hardware required includes a battery charger, video monitor with 5.8GHz receiver or similarly equipped FPV goggles. The Mach 25 from Blade is a 250-sized drone is designed for drone racing. It features forward-inclined motors to give you that extra edge in competition. The body features carbon-fiber and aluminium components for added robustness and it has been streamlined for enhanced aerodynamics. The body is also LED illuminated to ensure you stay on top of the drone’s orientation. The Blade Mach 25 sports an integrated ultra micro FPV camera with 5.8GHz video transmitter. Also, it’s SAFE technology makes FPV racing incredibly easy. It comes with an E-flite 1350mAh Li-Po 3S battery and has a flight time of about 6 minutes. The drone also comes with a Spektrum A3174 Flight Controller, and a Spektrum 25mw ultra micro FPV camera system. The camera is mounted with a carbon-fiber camera mount that reduces vibration. This feature makes it easy for pilots to see where they’re going more clearly. The Mach 25 uses powerful 2300kV brushless outrunner motors and canted motor mounts that allow for faster acceleration and higher speeds. It is one of the best-looking racing drones on the market and it also works great with a Dx6 remote controller. Blade Mach 25 FPV Racing Quad mit SAFE-Technologie. Racing at its best! The Eachine Racer 250 FPV quadcopter is the fastest drone available for the price range. 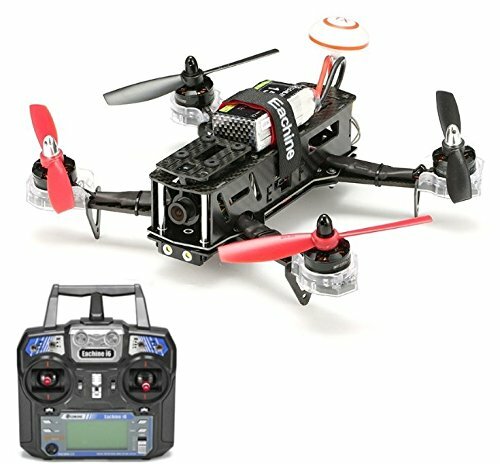 This is especially notable since it’s an RTF model, which is why it is considered to be one of the best RTF FPV quads available. All you need to do is charge the battery and hook up the receiver to it and you’re ready to go. This drone also comes with the ridiculous mushroom antenna seen in the Walkera F210. It also comes with a 1000TVL Camera with night vision, an FT200 VTX and an Eachine I6 receiver. This receiver has real-time image transmission and a long range of about 1600 meters. It is important to note that there’s a large 7 inch monitor right on the controller so you don’t necessarily need a pair of FPV goggles. The Eachine Racer 250 FPV has three different flight modes for three different levels of pilots and it is equipped with four 2300Kv brushless motors for power. The drone hits speeds of up to 25-30 mph. However, some pilots claim that they’ve been able to push it into the 40 mph range with some heavy modifications. You can also buy an ARF version for about half the price. The Storm Racing Drone Type A is another solid 250-class choice for your first real-deal racing drone. This drone is a great option for beginner pilots looking for high performance and customization. The Storm Type A is an optimized blend of the latest technology and components. It comes with the Foxeer 700TVL CMOS camera and the Storm FX799T video transmitter, which delivers amazing FPV experience. The drone comes with a nice 11.1V 2200mAh Li-Po 3S battery and has a flight time of about 11 minutes. This is incredible for such small quadcopter. The Storm Racing Drone Type A is an RTF racing drone and you’ll get an assembled drone including everything you need to start racing. All components are connected by easy electric plugs so no soldering is required for switching out the components. This drone has a lot of potential for modification even though it’s an RTF model. It is important to note that FPV video goggles aren’t included in the package. However, you’ll still get a transmitter able to stream FPV video. It also sports some of the most powerful motors on the market. The Storm Racing Drone Type A delivers powerful performance and RTF convenience and it is best handled by an experienced racer. The Lumenier G10 QAV250 is another small, but fully capable racing quadcopter. This drone is a reliable racing option. 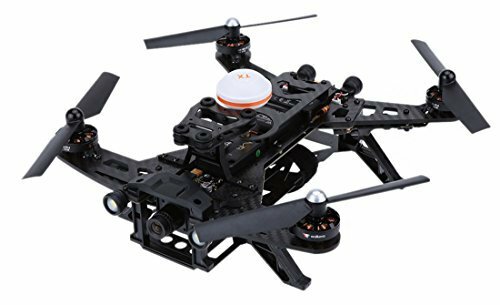 It has a proven track record and provides the flexible range of buying just the drone’s frame to RTF racing drone. The G10 QAV250 is a proven winner in FPV drone racing events due to the combination of a lightweight frame and powerful motors. However, such a high-performance drone is going to need a professional pilot behind the controls. The features and price of the Lumenier G10 QAV250 will depend on what sort of kit you’re purchasing. The RTF model is the fully tested and assembled drone for around $550. However, you’ll still need to buy your own transmitter and FPV gear. 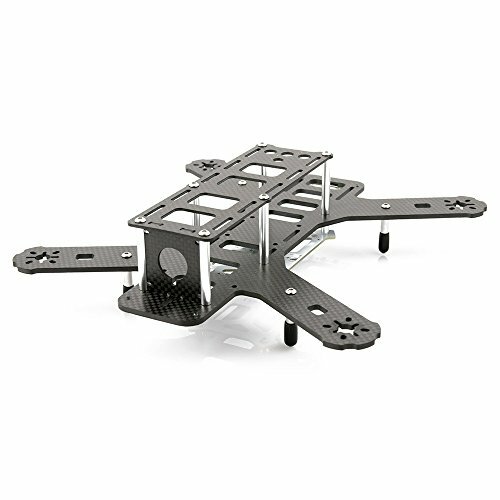 You can order the basic frame with mounts for motors, FPV camera, and HD camera for around $90 if you’re looking for more freedom to customize. The ARF kit adds motors, propellers, and the electronic speed control (ESC) component for around $280. Lumenier is known for their quality, and the airframe is designed to support powerful 2206 2000kv motors. The manufacturer offers varying levels of customization for any beginner pilot looking for a RTF racing drone or a foundation to build a winner. The Eachine Falcon 250 FPV Quadcopter is a good option for pilots who like to toy with and customize their drones. It is also a dream come true for speed demons and you’d be hard-pressed to find a faster drone at such an affordable price. The Falcon was really built for speed and the motors and Electronic Speed Controllers (ESCs) have both been upgraded on this drone. . The motors come with special mounts pre-installed that tilt the motors forward by 10 degrees. This means that the Falcon is going to require less camera tilt to achieve top end speeds. The camera is of a considerable quality and the Falcon comes FPV ready once you add a ground station (goggles or screen with a video receiver). 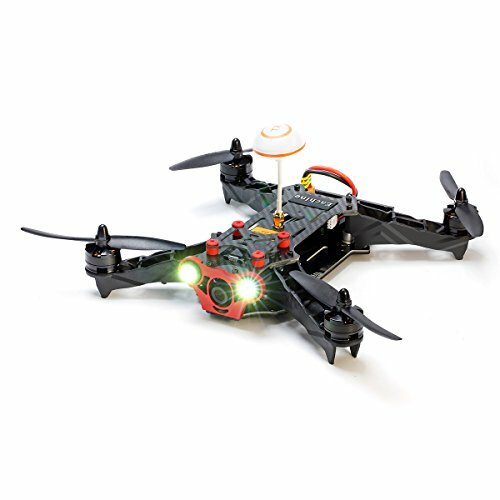 The name of the game when it comes to the Eachine Falcon is speed and this drone has top speed of over 90 mph. The Falcon is wildly popular among serious drone racing pilots because it is a great drone to customize. A Great Racing Drone: To Build or to Purchase? There are advantages and disadvantages to each option but there isn’t exactly a “rivalry” between pilots who purchase a racing drone as opposed to building their own drones. However, there are definitely two clear schools of thought. Purchasing a drone that is racing-ready is a good option for newbies and people who don’t consider themselves to be mechanically-inclined. When you purchase a drone you can usually count on some form of technical and repair support from the drone’s manufacturer. However, you could end up paying more for the drone itself as well as for replacement parts and service. Buying a racing drone takes significantly less time than building a UAV from scratch, but there is also a certain sense of accomplishment that one gets from building a racing drone. On the other hand mass-produced versions are usually more aesthetically pleasing than DIY racing drone so pilots interested in a “beautiful” drone may not want to build their own UAV. When you buy a drone you’re paying for the brand name so it could be less expensive to build your own racing drone from scratch. The problem is that you don’t get any kind of product guarantee as you do with drones you purchase. This means that pilots who build their own racing drones are often more adept at doing repairs themselves. You should visit a few races to get a feel for how things work at such events before you dive head first into drone racing investments. It is also recommended to talk to drone racing enthusiasts and experts about your desire to get started. You can visit parks and other locations where drone pilots are often found. You can also look for local groups or leagues in your area, and look for online drone racing forums. You must be willing to put in the practice time to become a proficient drone racer. It is important to note that each model handles differently so you should practice with the same drone you plane to race with. To hone your skills, you can set up courses on your own or use simulators. You should purchase one of the many affordable high-speed drones currently available if you’re new to drone racing and want to start as fast as possible. On the other hand, mechanically-inclined pilots might want to build their own racing drone. It’s time to race when you feel confident about your drone and your skills as a pilot. Remember that completing the race and learning from your mistakes are appropriate goals. FPV goggles add a whole new element to the sport of drone racing because they allow you to shave valuable seconds off your race time by being able to see every turn, obstacle and competing drone from your drone’s point-of-view. It is also a lot more fun to fly a drone using FPV goggles. We hope that we have accomplished our mission with this article and that we helped you to make wise decisions when it comes to purchasing one of the best drones for racing or building your own racing drone.